Tomorrow night at Abraxas is the next installment of the BJCP Style Guideline Tasting. This time they will be tasting Belgian and French Ales. These are some of the most interesting and unique styles around. This is a great way to try some beers you won't find in your every day bar and restaurants. For just $15 you will get a three ounce sample of each of these. 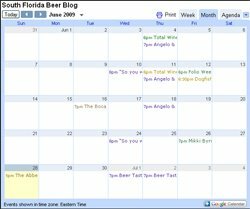 To find out more about the tasting and some special things that will be going on at the tasting check out the South Florida Beer Drinker's Meetup here. It's been so great to have stumble upon a nice blog. Interview: Adam Fine of Fresh Beer Inc.
New Dogfish Head Beers Available Now!! !